FAQs - Innovation Loft | UNLEASH YOUR TEAM’S POTENTIAL! Q: What is the Innovation Loft? Our mission at Innovation Loft is to help clients conduct breakthrough events that drive toward their goals in an accelerated and engaging fashion. Innovation Loft is uniquely designed to be the best possible facility for workshop events. We offer a stimulating, creative and supportive environment for a variety of session lengths lasting one day to a week. We provide a range of innovation workshop services including planning, facilitating and documenting your session. These collaborative sessions are designed through a proven methodology using a team of specialists who have facilitated workshops for industry leaders; such as Universal Studios, Moody’s, American Express, Disney, General Motors, and Reader’s Digest. Q: Where is the Innovation Loft located? Q: What is the Innovation Loft like? Everything about our facility is structured to foster creativity and innovation. The Innovation Loft is a large, open space with hardwood floors and 23-foot ceilings. It occupies the entire floor of a midtown office building with about 6,000 square feet of usable space, a large wall of floor to ceiling windows, and fully adjustable lighting to accommodate different mood and brightness preferences. We can custom configure the space layout to your specific event needs, including creating plenary and breakout areas separated by movable partitions, which also serve as magnetic, dry-erase writing and brainstorming surfaces. The facility features comfortable seating, over 30 flat-screen for presentations, branding, and promoting relevant content in the space, on-site printing, a state-of-the-art sound system that will set the right tone for your event, as well as fast and reliable WiFi, so everyone can be connected and working efficiently. Innovation Loft’s media center has an image and video library that will inspire, inform and support your event participants. There is also an array of books, toys and games throughout the space including trampolines, a punching bag, giant connect four, giant Jenga, sports balls and other unique items to bring out the creativity, loosen up the participants between structured activities, and boost productivity. Q: Is the space handicapped accessible? Yes, the building’s lobby, elevators, and restrooms within the space are handicap accessible and ADA compliant. Q: How many people can the Innovation Loft accommodate? In our traditional workshop setup the Innovation Loft most comfortably fits about 72 people, but our maximum capacity is 120 individuals with alternate layouts. Depending on set up needs, a half space rental is suggested for 10 – 40 people, and a full space rental would be perfect for 40 – 120. Q: What is the pricing? Prices vary depending on the specifics of your event or workshop. We recommend speaking with one of our representatives to create a personalized plan for your needs. Contact Us, now. Q: What is included the rental? Although we offer a range of services, certain amenities are included with each rental of our facility. We also provide continuous hot and cold beverages, packaged snacks, inspirational quotes, toys, and brain games to keep your team energized! If you have specific questions please contact us to speak with one of our representatives. Q: What types of sessions and workshops can be held at the Innovation Loft? 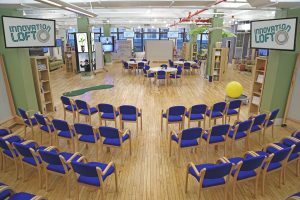 The Innovation Loft is perfect for any type of session or workshop that has a need for innovative thinking. The facility can be used for a wide range of events such as, strategy sessions, branding events, team builders, and small industry conferences. With a variety of furniture and floor plan options we will completely customize the space to suit the needs of any corporate event. Cross-company collaboration and planning and strategic partnerships. Q: How is a workshop at the Innovation Loft different from any other event space? Conducting a workshop at the Innovation Loft is a way of accelerating the discovery and implementation of creative solutions for tough problems. From vision statements to business strategies to staff training and more, our workshops have helped many large corporations come together and find solutions to large projects quickly and efficiently. Our strategy forces rapid ideation and creative thinking that ensures every team member’s voice is valued and heard. The end result is team alignment, improved job satisfaction, a greater trust among team members and a rapid solution process to big issues that challenge your organization.